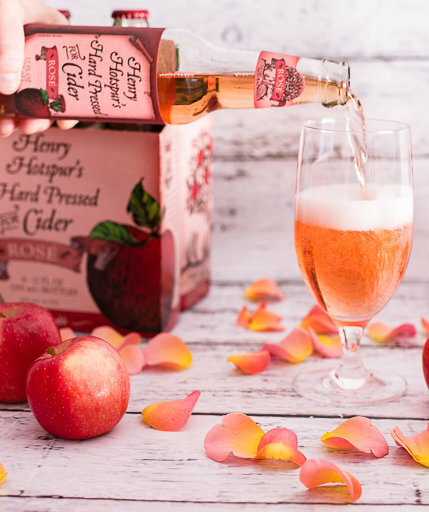 Hard cider is definitely having a comeback, and we're here for it—especially if it’s pink! Cider has always been a popular alcoholic beverage, especially as an alternative to beer for the gluten-sensitive. But this summer’s take on it, rosé cider, has millennial-pink enthusiasts running to their local liquor store. Lucky for those on a budget, Trader Joe’s has released their own rosé cider, which is sure to wow taste buds and wallets. Clocking in at $7.99 for a pack of six 12-ounce bottles, Henry Hotspur’s Hard Pressed for Rosé Cider is a steal at just about $1.32 a bottle. Though you might think this is a mixture of rosé wine and hard cider, it has no wine in it at all! On top of the great price, this partnership between Trader Joe’s and their brewing partner Henry Hotspur’s sounds absolutely delectable. Pacific Northwest apples are picked and juiced, and then combined with yeast to begin the fermentation process that makes it alcoholic. Rose petals and hibiscus are brewed into a bright pink tea, which is combined with the hard cider and carbonated to become rosé cider. The resulting cider is dry, floral (from the rose petals! ), and beautifully pink. It is a wonderful beverage to transition you from the long summer days to crisp fall nights.